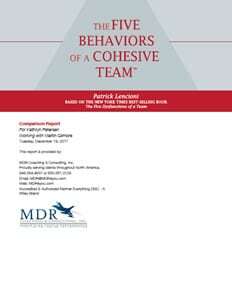 Five Behaviors of a Cohesive Team™ Sample Reports - MDR Coaching & Consulting Inc.
As much effort as it takes to build a cohesive team, the process does not have to be complicated. In fact, keeping it simple is critical. This report is designed to provide a clear, concise, and practical guide to improve your team. 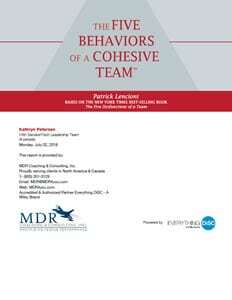 See a sample of The Five Behaviors of a Cohesive Team™ Profile. 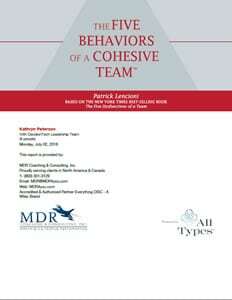 See a sample of The Five Behaviors of a Cohesive Team™ Profile – All Types. This report is designed to give you and your team insight into the progress you have made since you last took the assessment. 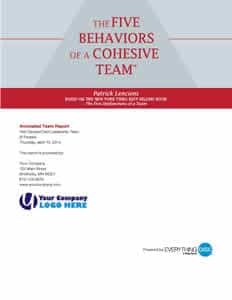 See a sample of The Five Behaviors of a Cohesive Team™ Annotated Progress Report. A cohesive team needs to master five behaviors: building trust, mastering conflict, achieving commitment, embracing accountability, and focusing on results. See a sample of The Five Behaviors of a Cohesive Team™ Comparison Report.